I think it’s been ten years that I’ve wanted to have chickens of my own. 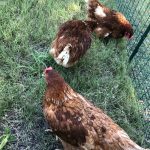 I’ve read books, taken classes, read city ordinances, moved, challenged a homeowners association and lost and FINALLY I have four of the most beautiful chickens in the world. 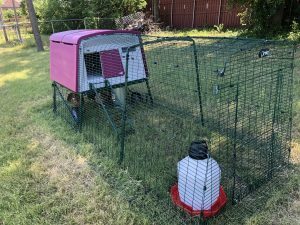 To recap: After accepting that being allowed to have chickens inside of the HOA in which we live was never ever going to happen, I found someone with acreage nearby and simply asked them if I could put bees and chickens on her land and she agreed. 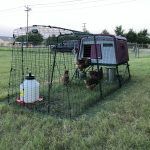 I decided to go with the Omlet Eglu Cube for my coop. Last weekend I got it put together with the help of my Bonus Mom and Bonus Brother. 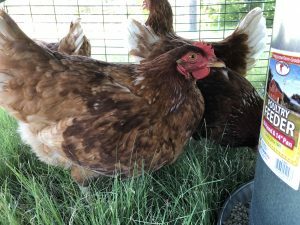 It sat empty all week while I waited for Saturday so I could drive to the farm store and buy four seven month old chickens. The gentleman I spoke to on the phone said that they had just started laying, so that is perfect. I didn’t have to mess with brooding chicks or feeding them or taking care of them for seven months. The mature chickens are more expensive but that’s fine with me. I think it’s worth it. Yesterday I got the hens to the coop, filled up the water and the feeder then I worked the beehive. I had also packed a bottle of wine and a chair. I texted my good friend to grab a chair and glass on her own and join me. We sat out in the pasture watching the chickens and drinking wine for five hours. 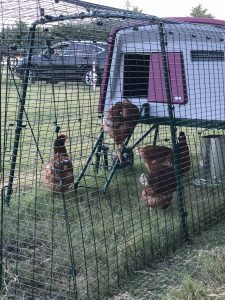 Earlier in the day I had tried to introduce the chickens to the coop so that they would know where to go when it got to be dusk. They weren’t having any of it. I started Googling to see if this was a common issue. 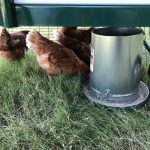 Lots of people seemed to say that the chickens needed to be trained to go into the coop. 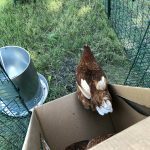 I thought we would wait until the sun went down when the chickens were settling in to wherever they were going to settle in, then I would pick them up and put them in the coop. So, we waited. As it started getting dusky, we started noticing one of the hens starting to look up to the coop. Then she went over to the ladder and stepped halfway up, then jumped down. A minute later she went up the ladder again, this time further. Finally on the third try she went all the way up and entered the coop. We were ecstatic! In another minute or so, another hen did the same thing. Then the third, then the fourth. We couldn’t believe it! They had done exactly what they were supposed to do! They got in the coop all by themselves! 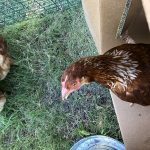 So, We closed the door to the coop, we closed the door to the nest box, and we went home. Now it is the afternoon of the next day. I let them out this morning. I opened the nesting box door. I came back a few hours later and still no eggs. I will go back again tonight to see if there are any. I’m sure moving (as well as any other stress) might put them off laying for a couple of days. Anyway, now I’m knee deep in chickens and I love it.